I am amazed at all of the devastation I have seen on the news and in photos. My husband takes a back road to get to the highway, that takes him to work. Yesterday, he found a road block and had to find a way around it, which isn't easy, since most of the roads are extreme back roads and probably worse. This is the road he goes on, this is why, he could not. This is the road that leads to our local rug hooking shop. The shop is further down and to the side of the river that caused this. 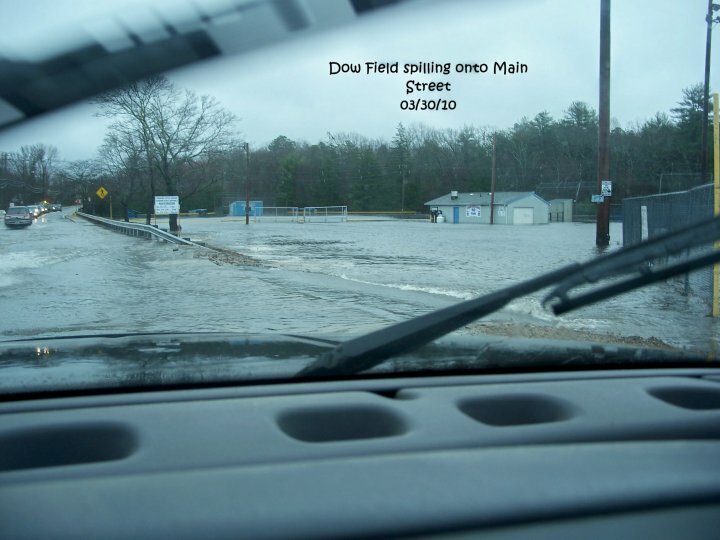 This is not a big river, but it is a long one and it is all coming down and flooding the towns it runs through. 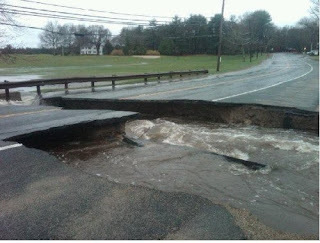 The river actually goes all the way to the end of the state and out to the ocean, so a lot of damage in it's path. 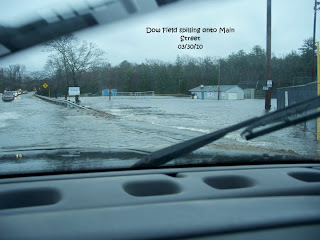 I did not take these pictures, I am staying close to home. We are in a dry zone, luckily. I finished my rug tonight and now I wish I had kept going on the border. I had more room to fit it on the bench and that would have given me plain space to put objects on, without covering the birds. But, it is smaller than I wanted, so I need to find a new place for it. At the moment, my dog is sick, so nothing is going on the floor. I have a few outside in the rain and a few that got hand washed. I think this one will make a nice wall hanging and being long and thinner, it will give contrast to other shapes on the wall. Here is the wool that I used for the border. I only took the dark brown parts to use around the edge and a few of the lighter ones. I can always use the lighter colors in another rug. 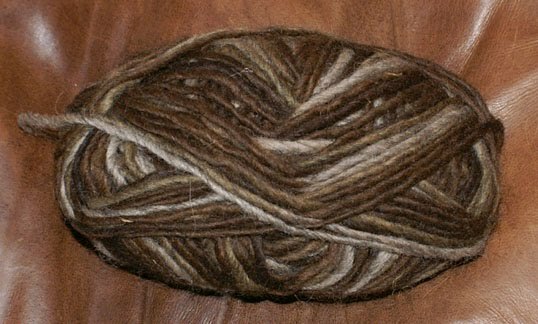 And here is the wool yarn that I used for the edge. I like how it varied and matched the border. 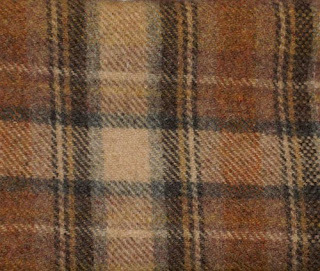 And here is the rug. Not the best photo, but you can get the idea of how it all looks together. It really has nice rich hues in it, so good for a light or dark area. I did a quick steam press, so it still needs a better ironing to relax the edges. 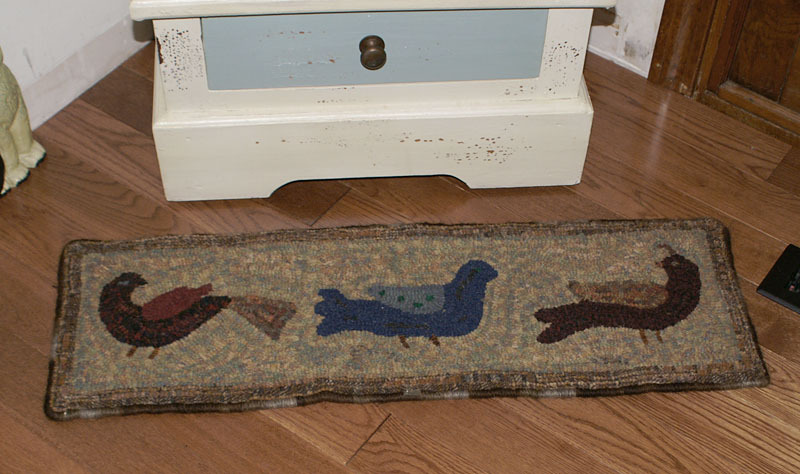 The rug pattern is by Maria, of Star Rug Company. I have been wanting to hook and procrastinating about it. 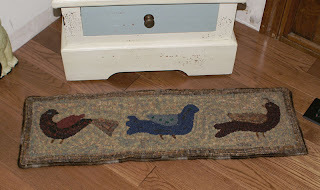 This week I received a rug pattern from Maria Barton, Star Rug Company. It was a for a prize I won in our ebay group, USAPRIM. I decided to try multi-colored textures, to give it more of a folk art fraktur look. 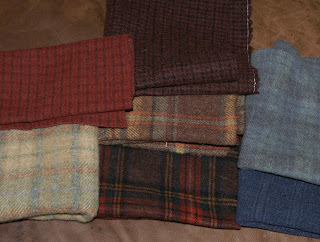 These are the wools that I picked for the birds and the background. On this bird, I used a dark and light, red plaid that was from a recycled Scottish wool skirt. I used a brighter red for the wing. I wanted to do two red birds, but with different shades, so I used a darker, black and red plaid for the body and the tail color as this one's wings, to balance it out. 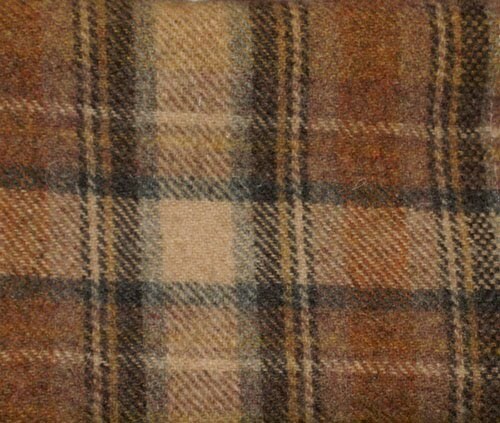 You can also see where I used the lighter, multi plaid with blue, for the background. If I recall correctly, that wool was a thrift find. 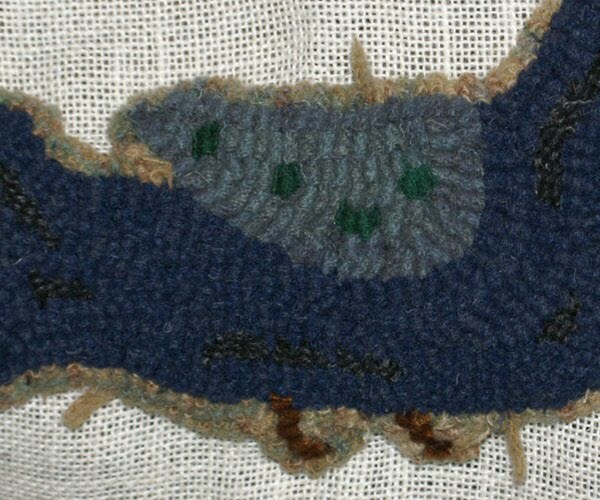 The blue bird is done with the darker blue for the body, the texture's design doesn't show up as well as I wanted. I used a contrasting blue/green for the wing. When hooking with mulit-colored textures, you never know what colors will pop us where, so it makes it fun to discover the designs as you hook. I am working on a new rug, a pineapple quilt and tonight a cross stitch design, so keeping busy. As soon as I have enough progress, I will show you. In the meanwhile, Dora is being herself as usual. I decided to make a doll quilt, something quick and easy. Only I, could mess up such a simple thing, lol. 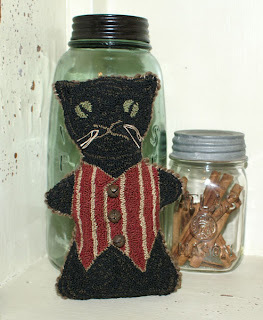 I machine sewed the pieces and used lana wool thread for the stitching. I antiqued it, but I really wanted it to look old. Well, I accidently spilled some water from the bottle on it and noticed it when I took the picture, nice stained look;) So, I will spritz it a little here and there to get more of an aged look. I was wondering whether I should be little black ties on it? What do you think? I decided to get PCStitch, so that I could make my own patterns. 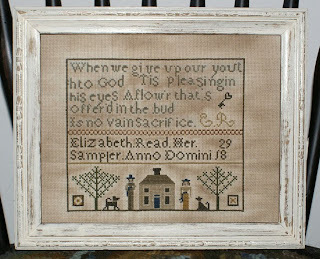 So, today I thought I would make one of my old freebies into a cross stitch. It was a good way to play around and get the feel of the program. I just used colors that would show up good against one another so you can stitch with any colors you want. Nothing fancy, but I hope that you enjoy it. I finally got around to antiquing my pieces. The first one I stained and realized when it came out of the dryer, that it had crease marks. So, I wet it a bit and ironed it out, so it is a bit better now. I wish I could get a picture to show how nice it looks in person. Really prim and it looks nice in that frame, but maybe a mat to go with it? It is just stuck in there for the photo, I still need to read up on how to frame properly and then I will frame it permanently. I stuck it in this frame for now to take a photo, but I need to find one that fits it better. If I had more room, a dark mat would really set it off. I can't wait to finish them and display them on my wall. I decided to get pc stitch so I can make my own and I am working on a mermaid piece. The program does not work as well as I would like, maybe I am missing something. But, I expected a nice clear color drawing to come out as a clear pattern. It gave me way too many colors and if you reduce them, you get horrid colors, so I forced to hand color it all again and redo the pattern itself to be clearer and more prim. I finally got around to finishing my bunny. 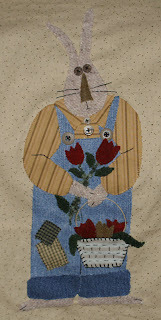 I wasn't sure what to do with the background, so I went with primitive stitchery. As you can see, I use fabric markers and pencils to draw things as I go. The blue chalk pencils, do not fade with water, so I guess I need soap. The purple marker fades after you draw it on, so I used that for the flowers, by marking each petal, as I went. Markers are so much easier to draw with too. After I finished, I sprayed it with water, then walnut spray. Then I stuck it in the dryer on a rack and that sets the stain. I also need to antique my clothespins. I love using them to hang small quilts with. The Stitching was done with lana wool thread, I love that for primitive stitchery. The bunny is a design from Twigs and Sprigs. 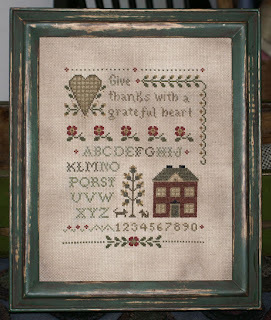 If you would like to make your own wall hanging, she has instant downloads, which are nice if you want to make something right away. 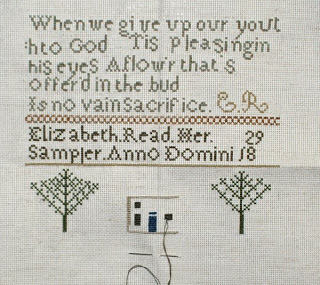 The original people were done in embroidery, so I had to make a similar version in cross stitch. Since I worked from a picture, I was unsure of the size and my letters are not exactly the way I would do them, if I was to do it with a graph. The next one, I will graph out first. Sometimes when I stitch, I do change things if I don't like the way the shape is. So what do you think? Should I leave it as is? I will be staining it, before I frame it. I will use walnut ink to age it. Today I received a surprise package in the mail. My wonderful friend Betty sent me a late birthday box. It is always fun to get unexpected gifts and even more fun when they contain wonderful gifts. 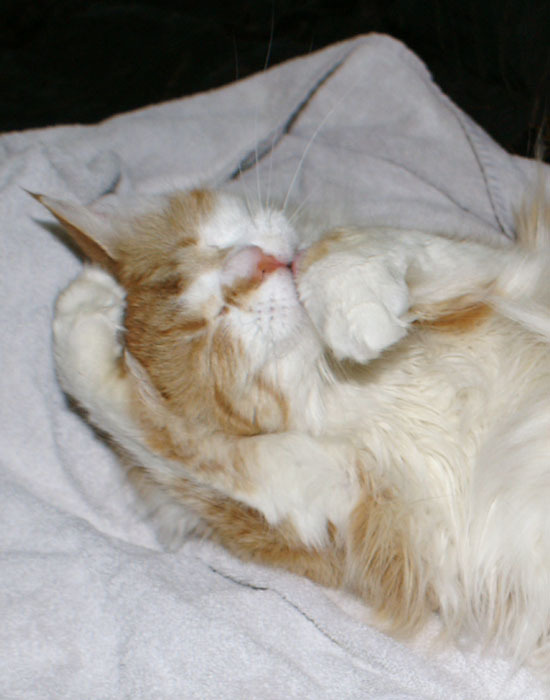 I wanted to show you the beautiful punched cat she made me. I just love it! 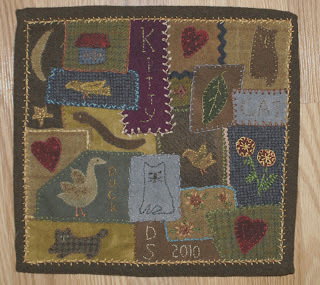 Betty has patterns for punched kitties and other animals, she does wonderful prim patterns. She also has a page with freebies for some fun patterns too. I am working on a new project and it is consuming my time. I made a cross stitch from a pattern and of course, I had to jump in and make my own. 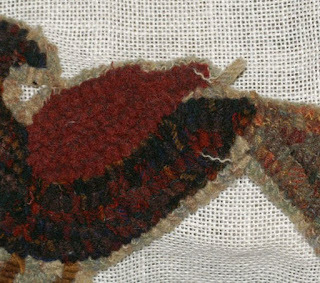 I saw an antique sampler that looked like fun to try. I am just doing the bottom half of it and working from the picture, so it is taking longer than using a chart. I tried to keep it the same, even the letters which tended to stray on her linen. I am working on the bottom picture now and then I will add a border around the entire design. Not bad for my first try at reproduction;) I did mess up on the window, so I stopped and will undo that tomorrow. 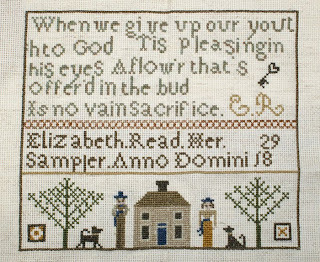 I finished my cross stitch and really had fun working on it. The booklet it came from is a gift from Melissa, to get me started with patterns, since I had none. I wanted to finish a rabbit, I started last year, but decided I have to think about the layout and what to add before I can. So, I decided to start a new one. This is smaller and will go nicely on my wall rack. 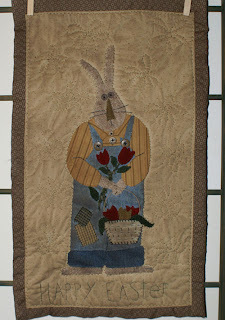 I used the bunny design from Twigs N Sprigs and made it into a wall hanging. I used my husband's old jeans, but wish I had gone with dark on the pants and light on the cuffs. I changed the sign to a basket again, but this time I added flowers. Now I have to decide if I want to leave it plain or add a saying. I was thinking it would be a fun piece to practice free motion and do little flowers for the quilting. This is what it will be like, now that the weather is warming up. 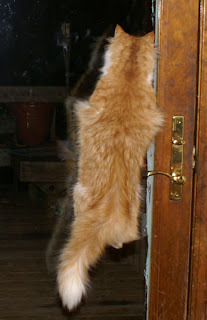 Nothing like a bug covered window to keep her amused. Tonight it was a lone moth. I am at it again, I can't help myself. I love to punch and create wonderful designs. 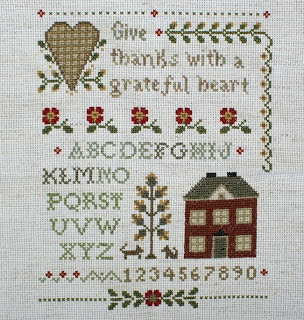 This wonderful design is from A Twigs N Sprigs pattern. I just love her designs and love working on them. You should check out the links on her site, I noticed today that she has some gatherings that you and your friends or shops can participate in, that sounds like fun. She has lots of free designs, but don't forget to support our fellow crafters, when you can, by buying their patterns, as well. Her designs will work for any type of crafting that you enjoy. I changed my piece up a little. He had a sign, so I decided that besides the beautiful flower, he has a basket of carrots for his Easter Love. 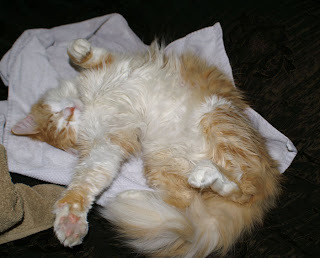 I really had fun punching him, he is just so cute. The piece will be up for sale on ebay, later tonight. To answer the question: Is punching like rug hooking? Punch needle is worked with a tool, sort of like a fat pen, that you thread your floss through. You work through the back of your material and punch to the front side, where you will see the loops, when you are finished. 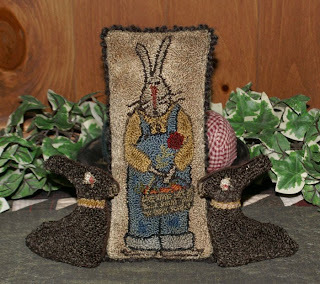 With rug hooking, you have a hook, similar to a crochet style and you pull your loops up from the front side. 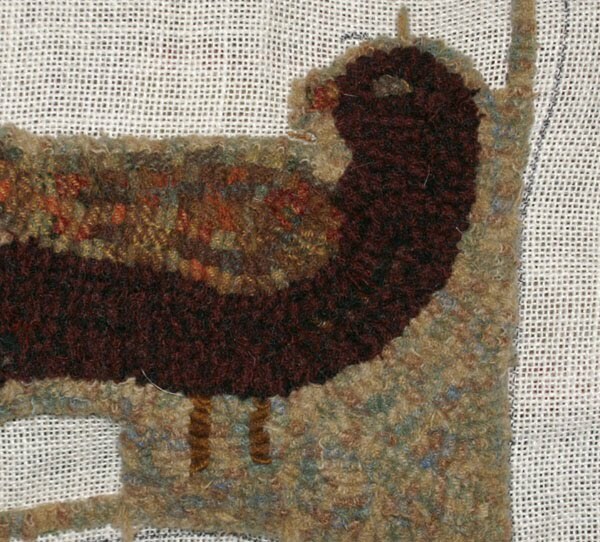 You usually use wool strips with rug hooking, but there are those who use yarn and other materials. Today we got a lot of snow, but too warm, to stick. I wanted to take a better shot of the crazy piece, but guess not. 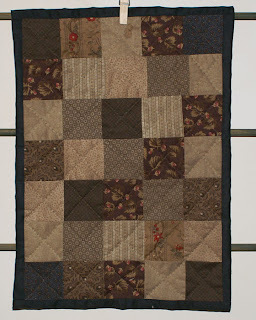 I don't plan on making a bigger quilt with it, I just made it into a small square and hung it on the wall for now. Today I was in the mood to punch and I wanted to try some rabbits. 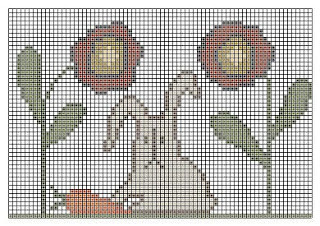 Someone said they loved chocolate rabbits, so I thought I would use my old rabbit pattern and make it into a punched pair of bunnies. 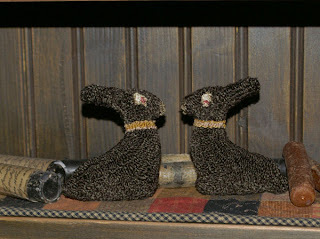 I used a brown wool for the back and then stuffed them. I like how they came out in some ways, but think I need to change the shape a bit on the bottom, so they are not so long and sit in a bowl better. I also had a hard time turning the ears and pulled at it too roughly, so it pulled out a few loops too. It was a good practice run and not something I would sell since they are messed up. I think it would be easier if I made stuffed ones to put in my wire basket, these would take too long. I also think that if I do some more, I will leave the neck plain and tie a real bow or something primitive around the neck. I finally finished my crazy block. I had no pattern, I just stuck some wool together and put things on it. I do have a crazy quilt book that I use for stitches, but I cannot figure most of them out, so I make them up. I cannot get a nice photo with flash, so it looks way off. I adjusted the contrast to tone it down, but I will have to take a better shot in outdoor light. It does look much more prim in person.